308 pages | 19 B/W Illus. 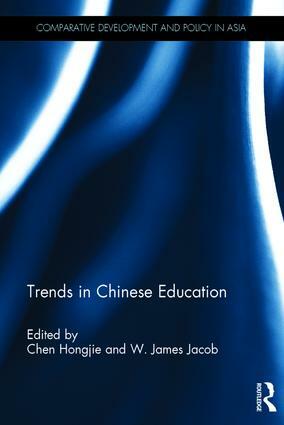 This book considers a wide range of key developments and key areas of debate in China’s education system. Marketization, quality assurance, and issues of inequality and gender are all discussed, as are expansion in the primary, secondary and tertiary sectors, the impact of globalization, and the influence of education on China’s economic growth. The book, which comprises contributions from many leading authorities, will be of great interest both to comparative education specialists, and also to all those interested in China’s rise and development. Hongjie Chen is a Professor at the Institute of Higher Education, Peking University, China, and Editor-in-Chief of the Peking Education Review. W. James Jacob is an Associate Professor of Higher Education Leadership at the University of Pittsburgh, USA. His research and leadership interests include higher education strategic planning; academic affairs; quality assurance; organizational development; organizational effectiveness; and indigenous education issues of culture, language, and identity as they relate to post-secondary education. The primary aim of this series is to publish original, high quality, research level work, by both new and established scholars in the West and East, on all aspects of development and policy in Asia. The scope of the series is broad, and aims to cover both comparative and single country studies, including work from a range of disciplines. With particular reference to how Asian states have coped with the growing challenges of globalising economies and the ways in which national governments in Asia have changed their public policy strategies and governance models in order to sustain further economic growth, the series will bring together development studies, and public policy and governance analysis, and will cover subjects such as: economic development; governance models; the factors underpinning the immense economic achievements of different countries; the social, political, cultural, and environmental implications of economic restructuring; public policy reforms; technological and educational innovation; international co-operation; and the fate and political impact of people who have been excluded from the growth. The series will include both empirical material and comparative analysis; and both single authored books and edited collections.